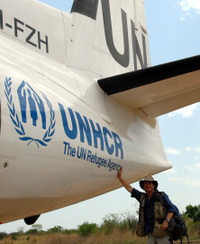 While searching for Nebraska connections in Gambella Ethiopia I was afforded the opportunity to join a couple of UN/IOM flights as they move people back into South Sudan. I have a newspaper column dedicated to this adventure, but have included some photos for the blog entry that will not be found with the column. Many students have asked me about the animals I’ve been seeing. 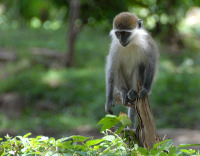 Ethiopia has many different kinds of animals. The geography of this place provides many different kinds of ecosystems. Ethiopia has the lowest point in Africa and has the fourth highest peak, so you have scorching badlands to fertile farmland and everything in between. This means lots of different animals in different locations. Well, I made it back to the capital Addis Abba. For the last several days I have trying to digest the vast amount of information I absorbed. The trip to Gambella was a big success in many ways, and I will be writing more details about my journey to there in upcoming columns. After 10 days of rain clouds taunting the Gambella region like a fenced off swimming pool, the rain began to fall. Nights before I had seen storm clouds in the distant nighttime sky filled with lightening, as the stars hung over head. It was a warning sign that things would eventually change as they have for countless years. This was my sign that it was time for me to be on my way. Once the rains begin, roads turn to mud making travel difficult and sometimes impossible.